Jacqueline (Jacquie) is a skilled facilitator and Master Trainer and holds a diploma is LEGO® SERIOUS PLAY® methodology from the LEGO® Group in Denmark. In 2007, Lloyd Smith received the partner business growth award from LEGO® and also that year, she began certifying facilitators for The LEGO® GROUP. In 2009, Jacquie was appointed to the training board in the LEGO® Play for Business division where she worked to bring LEGO® SERIOUS PLAY® methods into the Open Source model. Jacquie is a Registered Art Therapist (ATR), is certified in Play Therapy & Creative Problem Solving. In 2000, she earned an MA in Conflict Analysis and Management; and in 2006, she completed an MBA in Executive Management (Management Consulting). She earned both degrees from Royal Roads University in Victoria, British Columbia, Canada. In 2005, she studied business strategy and global business in Grenoble, France. In November 2006, she received the Ted Wilson Memorial Award for Lifelong Learning from Royal Roads University. Jacquie instructed at the University of Western Ontario in London, Ontario Canada for over ten years, where she developed and delivered curriculum for the postgraduate Art Therapy students. She has also taught in the business department at Lakehead University, Thunder Bay, Ontario, Canada. She is an associate faculty member in the MBA program at Royal Roads University in Victoria. During her career, she has trained and facilitated thousands of professionals in North America, Central and South America, Europe, and Asia, with modules she specifically developed to meet their needs. She has been a certified Canadian Management Consultant since 2009 and holds NAFTA Secret Clearance. Stephen is a connector and a natural born team builder and problem solver. He comes from a mechanical and building background with over 10 years experience as a bicycle mechanic. As a designer, he holds certifications as a guitar builder (Luthier) and studio wood furniture making. He is also an accomplished musician. Stephen is certified and registered as a Strategic Play® facilitator with LEGO® SERIOUS PLAY® methodology and has been training in LSP since 2010 under one of the original LEGO® Master Trainers. He has level II certification in Simplex Creative Problem Solving and Decision Making, trained directly by Dr. Min Basadur. He holds certificates in Agile Coaching, Project Management, Simplex, Creative Problem Solving, and is a graduate of Royal Roads University with a certificate in Executive Coaching. Today, he facilitates and trains in LEGO® SERIOUS PLAY® methods throughout Canada, USA, Central America, (Panama) and South America (Venezuela), Japan, Austria, and Australia. Occasionally he teaches at Royal Roads University where he acts as a Strategic Mentor in the MBA program: Advanced Strategic Integrated Practice. This is a fast-paced, intensive, problem-based learning program and Stephen is there with LEGO® bricks ready for business analysis. Stephen credits his creative talents to playing with LEGO® as a child. Rosa es una panameña con habilidad natural para ayudar a las personas a desarrollar sus talentos, llevándolas a acciones que les permitan alcanzar su máximo potencial de desempeño. Su pasión por ayudar a los demás la llevó a especializarse como psicóloga en la Universidad Santa María La Antigua; tomó una maestría en educación, psicología y consejería de University of Louisville, además se certificó como Coach de la International Coaching Community (ICC Londres y Brasil) y Coach Deportivo por Sport Coaching World (SCW México), ayudando, durante los últimos 5 años, a atletas de alto rendimiento, músicos, profesionales y ejecutivos a lograr sus metas. Hoy día lleva su pasión a la práctica utilizando tecnologías “Hands-On” de STRATEGIC PLAY® con el método LEGO® SERIOUS PLAY® y la metodología de Solución Creativa para Problemas del Instituto de Creatividad para Solución de Problemas (CPSI). Sus antecedentes variados en desarrollo humano, servicio al cliente en la industria de la hospitalidad, creatividad, su propia práctica deportiva y artística, y su espíritu aventurero, le permiten aportar al equipo más de 15 años de experiencia en la elaboración y ejecución de programas para el desarrollo del talento. Rosa es nuestra capacitación con licencia en América Central y ofrece capacitación en español. Por favor, lea más aquí. Anibal acredita que a criatividade é a base para ter uma vida melhor, em todos os aspectos. “Somos treinados a vida inteira para pensar de forma limitada”. O pensamento criativo é chave para libertar desta prisão criada. Anibal trabalha com criatividade há 23 anos. Ajudar as pessoas a verem as coisas de uma forma diferente, buscar novas perspectivas é foco do seu trabalho. Anibal tem usado o lsp em processo de coaching, planejamento estrátigico, construção de equipes e criação de novos negócios, tendo como central a capacidade de fazer novas conexões e criar coisas novas. Yelda is very excited to be the first and only LEGO® Serious Play® Facilitator Trainer in Turkey and Eurasia. Yelda has a degree from Istanbul Technical University as Aerospace Engineer. She has Master of Science Degree in Engineering Management. She has been working on project management, process development and improvement areas over 18 years. Yelda is certified and registered as a Strategic Play® facilitator with LEGO® SERIOUS PLAY® methodology. She is a trainer of facilitator with the Strategic Play Group Ltd. and delivers facilitator training programs and end-user workshops. She has experience in agile and waterfall product development for defense, finance, and telecom industry. She has worked on every phase of projects from concept to sign-off the products, working side by side with project teams. She has experience on the establishment of process systems in accordance with Capability Maturity Model Integration, IEEE standards and other product development standards. She conducts many workshops by merging LEGO® SERIOUS PLAY® materials and methods, such as Agile Values and Principles, Agile Project Management, Scrum, Agile Tools and Techniques, Business Analysis Tools and Techniques. Yelda focuses on both efficiency and effectiveness of processes. She helps teams on understanding their processes and dynamics, via trainings and workshops. She is passionate about sharing her experience. She also holds following certifications EFQM Assessor, Introduction to CMMI, PMP, PMI-ACP, PMI-PBA, SAFe Agile. Sébastien se distingue par sa passion de l’enseignement et de l’apprentissage par la pratique. Son cheminement a débuté après ses études en administration des affaires où il a accédé au poste de Directeur en développement des affaires pour une compagnie d’assurance de calibre pancanadienne. Son mandat consistait à accompagner et former des courtiers dans leurs connaissances des produits financiers et le développement de leur service à la clientèle. Sébastien a obtenu en 2003 un MBA en gestion des PME et en consultation. Il a été consultant et mentor en démarrage d’entreprise pour ensuite se lancer dans le financement commercial pour une banque canadienne. Afin de réinvestir son intérêt dans le coaching, l’enseignement et le partage de connaissances, il quitte le domaine des finances en 2008 pour devenir professeur permanent en administration des affaires. Sébastien continue de s’impliquer dans le milieu des affaires et des start-up. Il est administrateur sur plusieurs conseils d’administration. Il participe également à des panels et comités où il doit analyser des plans d’affaires, des candidatures pour des prix de reconnaissances tel que des bourses et des prix mérite. Il est membre de l’Ordre des administrateurs agréés du Québec. Sébastien applique les méthodes LEGO® SERIOUS PLAY® avec des start-up d'entreprise. Ses connaissances approfondies dans les affaires et l'éducation en font un formateur parfait. Il facilite et forme LSP en français. Il vit avec sa famille au Québec. Sébastien Giroux es nuestro entrenador autorizado y está feliz de entregar nuestro plan de estudios en francés o inglés. Greg Bliss is a Consultant, Facilitator, Mentor, Executive Coach, and Trainer with more tan 25 years of organizational development experience. 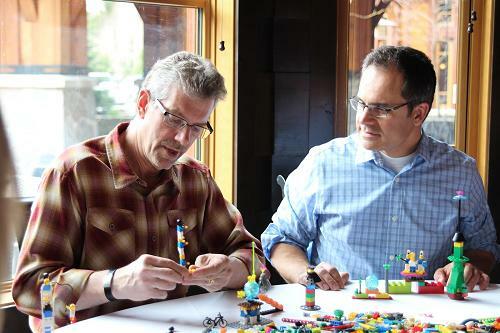 Not only does Greg offer facilitator training and certification in LEGO® SERIOUS PLAY® methods, he works with entrepreneurs in the country’s largest incubator – 1871. Greg conducts workshops in crafting an effective pitch and helping start-ups who are gaining momentum scale their organizations. 3) Work with leaders to champion change and enable innovation. Greg’s experience with top US companies in Pharmaceuticals, package goods, manufacturers, tech, and financial sectors make him an excellent trainer. Sandra Lunn has built a strong reputation over 20 years as an in-demand corporate trainer, vocational educator, facilitator, workplace coach, assessor and consultant as well as holding senior training organization roles in the Oceania vocational sector. Sandra brings a powerful combination of professional training expertise, flexibility and adaptability, industry currency and innovative approaches to often challenging environments. She has worked for clients across Australia, Africa, Sri Lanka, Bali, London and currently, she is located in Macau, China. Sandra has been using LEGO® as a facilitation approach for many years and Certified LEGO® SERIOUS PLAY® Methods Facilitator and Trainer. Sandra finds LEGO® a powerful tool as it can be applied to a multitude of situations. It is great for getting participants to use out of the box thinking, for teams to communicate differently, for leaders to develop strategy, for the sharing and creating of ideas and to incorporate some fun into the learning environment. Certified LEGO® SERIOUS PLAY® Methods Facilitator. Certified facilitator of TAE40110 Certificate IV in Training & Assessment, Australia. Registered Corporate Coach™. Master of Business Administration. Bachelor of Mathematics. As an award-winning communicator and a professional people developer, Brian specializes in LEGO® SERIOUS PLAY® methodology, leadership development, adult learning, and design and delivery of blended learning. He has delivered a vast array of programs, including leadership development, management skills, business psychology, team development, guest service, storytelling & presentation, and train-the-trainer, covering thousands of participants from all walks of life. Sectors that Brian has trained and served include gaming and hospitality, F&B, universities, banks, utilities, governments, NGO and legislative council member. Arturo Giménez es Coach Ejecutivo por la Escuela Europea de Coaching y Coach de Equipos por la Universidad Francisco de Vitoria, certificado doblemente por la International Coaching Federation (ICF). Ha recibido competencias como participante en el Programa de Negociación de la Universidad de Harvard y es un Entrenador con licencia en el método LEGO® SERIOUS PLAY® (November 2018). Ingeniero Técnico en Topografía por la Universidad Politécnica de Valencia (España), viene desarrollando una intensa actividad profesional entre Europa, Estados Unidos, Canadá y América Latina desde hace más de 20 años. Ha estado vinculado durante años al sector de las nuevas tecnologías y trabajado en compañías multinacionales como Tom Tom, Nokia y HERE, esta última propiedad del consorcio formado por Audi, BMW y Daimler -Mercedes - Benz-. MBA por el IE (Instituto de la Empresa), cuenta con amplia experiencia y probados casos de éxito en países y territorios como España, Estados Unidos, Cuba, México, Centroamérica, Argentina, Chile, Uruguay, Brasil, Colombia, Perú, Ecuador, Bolivia y Paraguay. Cuenta con la certificación de calidad Green Belt en procesos Lean Six Sigma, otorgado por la American Society for Quality. Es profesor asociado en la División de Educación Continuada de la Universidad El Bosque (Bogotá), co-facilitador de Programas de Coaching de Equipos en el Instituto de Desarrollo Directivo Integral (Madrid) y colaborador en el Global MBA de la Universidad CEU Abat Oliba (Barcelona). En un entorno altamente volátil e incierto, donde la deshumanización de muchas organizaciones y procesos parece ser una fuerte tendencia, Arturo se desvive por dotar de las herramientas y recursos necesarios a personas, equipos y organizaciones de manera que puedan reforzar su presencia y elevar el factor humano al nivel que, ahora mas que nunca, la sociedad requiere. Arturo Giménez is an Executive Coach (European School of Coaching) and Team Coach (Francisco de Vitoria University), double certified by the International Coaching Federation (ICF). He participated in the Negotiation Program at Harvard University and is a Licensed Trainer of the LEGO® SERIOUS PLAY® Methodology (November 2018). Holds a Technical Engineering degree in Topography from the Polytechnic University of Valencia (Spain), and has developed his professional career between Europe, the United States, Canada and Latin America for more than 20 years. Since ever connected to the new technologies sector, he has worked for international corporations such as Tom Tom, Nokia and HERE, the latter property of the consortium formed by Audi, BMW, and Daimler -Mercedes - Benz-. He holds an MBA by IE (Instituto de la Empresa), and has extensive experience and proven success business developments in countries and territories like Spain, the United States, Cuba, Mexico, Central America, Argentina, Chile, Uruguay, Brazil, Colombia, Peru, Ecuador, Bolivia, and Paraguay. Green Belt quality certification in Lean Six Sigma processes, granted by the American Society for Quality. He is an associate professor in the Division of Continuing Education at the Universidad El Bosque (Bogotá), co-facilitator of Team Coaching Programs at the Integral Management Development Institute (Madrid) and collaborator at the Global MBA at the CEU Abat Oliba University (Barcelona). In a highly volatile and uncertain environment, where the dehumanization of many organizations and processes seems to be a strong trend, Arturo goes out of his way to provide the necessary tools and resources for people, teams and organizations so that they can reinforce their presence and raise the human factor to the level that, now more than ever, our society requires. Dr. Steve Ralph, Jr is passionate about catalyzing ingenuity in those he comes into contact with. Along with being a Strategic Play LEGO® SERIOUS PLAY® methods licensed trainer, he is also the Founder and CEO of Open Ingenuity LLC, an organization focused on consulting, coaching and producing special events that facilitate creative leadership. Not only does Steve create great solutions with clients, he is also a professor at Pepperdine University's Graziadio Business School, Dr. Ralph teaches courses in creativity and innovation, leadership and team dynamics. He consults with organizations utilizing the creative problem-solving process, is a certified trainer in the FourSight Thinking Assessment and a coach, with training from the Coaches Training Institute (CTI). Dr. Ralph’s professional background has included business development and corporate relations roles in higher education, entertainment and non-profit industries. Dr. Ralph earned his Doctorate in Organizational Leadership from Pepperdine University. He is a frequent speaker at international creativity conferences and has been active in several professional organizations, including the Creative Education Foundation and Consortium of Southern California of Colleges and Universities, where he served as co-chair for the Ventura and Santa Barbara Counties region. Dr. Ralph’s research interests are centered in creativity and innovation, with special focus in personal disruption, pause practices and the impact of exponential technology. April Anazodo transforms ideas into action. As a creative strategist, April has helped a number of organizations across various industries design implementable roadmaps to achieve their long and short-term objectives. She accredits her strong analytical skills to her training as a Lawyer and love for legal sitcoms. April has worked with one of Africa’s biggest banks where she developed several governance frameworks and strategic policies implemented in 20 African countries. Her mind is a whirlwind of endless possibilities, she envisions Africa as an innovation hub for the rest of the world and is passionate about raising ingenious leaders who would realize the potential of the African continent. Having found the perfect tool, April creatively infuses her knowledge of the corporate climate in Africa in her application of LEGO®SERIOUSPLAY® methods to help organizations navigate through disruptive change. Not only is she a certified facilitator but she is also a certified, licensed trainer in the method of LEGO® SERIOUS PLAY® and leading the way in Africa. Dr. Jumoke Fola-Alade is passionate about Creative Thought Leadership and is convinced that the African continent is impoverished by hectares of unmined wealth of human capital that can be harnessed with the right methodologies and tools to empower Africans to “Rethink For Change” through play. Jumoke is ready to play her part in a catalytic process that prepares the vast African continent to be the dominant “play-er” in 4th Industrial Revolution. She is a Dental Surgeon by qualification (College of Medicine University of Lagos) with a Masters degree in Informatics (Kings College London). She is also a certified advanced creative writer (Pan African University). Her practice as a poet and spoken word performer, which spans over a decade in the atypical corporate space has positioned her uniquely to interact with an emerging workplace future that will be driven by an unprecedented demand for creativity. Along with being a certified LSP facilitator, she is also a certified, licensed trainer in the method of LEGO® SERIOUS PLAY® and a key member of the Strategic Play Group’s training team. Kari is passionate about bringing out the best in people so she uses LEGO® SERIOUS PLAY® methods to help individuals, teams, and organizations improve their performance by connecting with themselves, with their purpose, with each other and with collective goals. Kari is from the United States and currently lives in Brazil. She is fluent in both English and Portuguese. She holds a BA in Organizational Communication and Business Management from Western Michigan University and International MBA in Project Management from Fundação Getulio Vargas. Hugo ha sido consejero, consultor, facilitador y coach de negocios desde 1999, especializado en Planeación Estratégica, Ventas Consultivas, Mercadotecnia e Innovación. Además de ser entrenador autorizado de Strategic Play® en los métodos de Lego® Serious Play®, es Socio Fundador de CUBO Estratégico. De 2001 a 2007 fue Gerente Senior en Ernst & Young. Adicionalmente, es profesor a nivel maestría en ITAM, UP, UNAM y CETYS Universidad. En 1996, obtuvo el grado con mención honorífica de Ingeniero en Ciencias por CETYS Universidad, cursando su último año en McGill University, Montréal, Quebéc, Canada. En 1999 obtuvo el grado de Máster en Dirección de Empresas por el IPADE y del 2012 al 2014 cursó estudios de maestría en Mercadotecnia en el ITAM. Esta certificado como Coach de Negocios por parte del International Coaching Community, como facilitador en metodología LEGO® Serious Play® y como PMP por parte del PMI. HUGO has been a business consultant, facilitator, and coach since 1999, he is specialized in strategic planning, consultative B2B sales, marketing, and innovation. Along with being a Licensed Trainer in the Lego® Serious Play® methods for Strategic Play®, he is also the Founder and CEO of CUBO Estratégico. From 2001 to 2008 he was a Senior Manager in Ernst & Young. He is also a Professor at ITAM, UNAM, UP and CETYS University. In 1996 he earned with honors a B.S. degree in Computer Science Engineering by CETYS University. He attended the last year of the undergraduate program at McGill University, in Montreal, Quebec, Canada. In 1999, he earned his MBA degree from IPADE Business School and he attended graduate courses of the Master´s degree program in Marketing at ITAM from 2012 to 2014. He holds the following certifications: Certified Business Coach by the International Coaching Community, Certified facilitator in LEGO® Serious Play® and PMP by the PMI. Sarah is a Creative Facilitator and Visual Storyteller based out of Portland, Oregon. She introduced innovative facilitation methods inside a Fortune 500 technology giant. A self-taught graphic recorder and graphic facilitator, Sarah loves to spark and encourage creative and visual thinking in others. In addition, she creates explanatory and marketing whiteboard animation videos on a variety of topics ranging from technology to policy. Upon discovery of LEGO® SERIOUS PLAY® she quickly fell in love. The uniqueness and engagement of the methodology is the perfect match for her social, creative, and playful spirit. Sarah loves designing thoughtful and effective sessions that yield the desired outputs – and gets very excited about finding new ways to apply LEGO® SERIOUS PLAY®. As a bonus, spending so much time with LEGO® bricks is earning her mad-building skills that will impress her toddler when he gets older. Cheryl has 35 years of experience working in the service industry with both corporations and business owners. She has worked as a Director at multiple companies including McDonald’s, Cobs Bread, and KFC/Taco Bell. Cheryl attended Royal Roads University in Victoria and graduated from Executive Coaching, she is also an ICF certified executive coach that is known for asking questions that get to the heart of the matter. She is fiercely committed to her clients’ success and provides the support they need to exceed their goals and foster growth within their companies. Cheryl has worked with all levels of leadership to transform cultures, improve communication, and inspire businesses to thrive. She is also trained and certified in LEGO® SERIOUS PLAY® methods. Denise heads up Management Consultancy International where she is both a consultant with global brands on people, culture, values, training and business performance needs. MCI is known for using the innovative LEGO® SERIOUS PLAY® methods and materials and Denise was the first consultant and trainer in Australia to use this tool. Through her training and development work Denise had ensured that MCI is at position #7 on the BRW list of Australia’s most innovative companies. As a long time strategic partner with the LEGO® Systems Group in Denmark, in 2009 Denise was appointed to the LEGO® SERIOUS PLAY® Training Board and became a Master Trainer in the method and materials of LEGO® SERIOUS PLAY®. She now offers Strategic Play® Facilitator training and certification in LEGO® SERIOUS PLAY® methods and materials through MCI. Denise has co-written two books on Strategic Play: The Creative Facilitators Guide volumes one and two. Denise has been in the corporate training industry for over 24 years. She holds a Master’s Degree along with a PhD in English. She has been appointed an honorary member of City and Guilds, the largest examining body in the UK, in recognition of her significant involvement and contribution to vocational training and education. Walter (Walt), is located in beautiful San Francisco, California! When he is not facilitating or training LEGO® SERIOUS PLAY® you can find him teaching MBA students at Golden Gate University. He has been trained and certified in LEGO® SERIOUS PLAY® since 2007. He has been training in LSP since 2010. His work as a facilitator with the Creative Education Foundations spans 35 years. Walt holds an MBA and a Doctorate in Business Administration. He is Professor of Management and Communications at Golden Gate University in San Francisco, California, and is a Colleague of the Creative Education Foundation in Hadley, Massachusetts—active as a facilitator with the Creative Problem-Solving Institute. He teaches business students at the undergraduate, master’s and doctoral level and works in the community facilitating creative problem solving. He is a certified LEGO® SERIOUS PLAY® facilitator and an all around great guy! Walt educates and trains the practical application of management decision-making theory to adult learners pursuing bachelor’s degrees, MBA’s, and doctorates. Margaret recently completed a 30-year career in senior management with the federal government of Canada. Her work experience ranges from advising Cabinet Ministers on communications change issues, to managing complex transformational projects in a number of large organizations. A native of Montreal, Margaret is multilingual and works globally. By combining research with practice, Margaret takes a “prac-academic” approach in her chosen field. Margaret has been certified in LEGO® SERIOUS PLAY® methods since 2015. She has researched LSP and other creative tools comparing and contrasting trust and meaningfulness theories within the LSP framework. She has presented her findings in Canada and the United States in academic conferences. Margaret is fluent in five languages and can successfully support all training efforts across cultures. Margaret is a true believer in ethical management, having understood through her experience that transformative change cannot happen without organizations seriously considering how to enable, build, and maintain trust in the workplace. Her recent book, Trust and Organizational Capacity for Change, is available at Amazon. Margaret obtained her PhD in 2009, from Fielding Graduate University. Her dissertation chair and mentor is Dr. Thierry Pauchant, Chair of Ethical Business Management at HEC, (Hautes Etudes Commerciales), Université de Montréal.